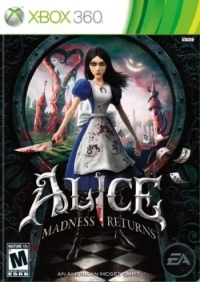 Can Alice save her once-beautiful Wonderland-and herself-from the madness that consumes them both? Overcome evil with unusual weapons including the legendary Vorpal Blade. Wonderland's residents are back-but not necessarily as you remember them. 11-07-2016 jason Box Text We're All Mad Here Can Alice save her once-beautiful Wonderland-and herself-from the madness that consumes them both? Overcome evil with unusual weapons including the legendary Vorpal Blade. Wonderland's residents are back-but not necessarily as you remember them. 04-10-2013 artikskarab Box Text We're All Mad Here Can Alice save her once-beautiful Wonderland-and herself-from the madness that consumes them both? Overcome evil with unusual weapons including the legendary Vorpal Blade. Wonderland's residents are back-but not necessarily as you remember them. 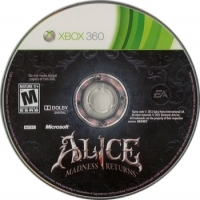 This is a list of VGCollect users who have Alice: Madness Returns in their Collection. This is a list of VGCollect users who have Alice: Madness Returns in their Sell List. 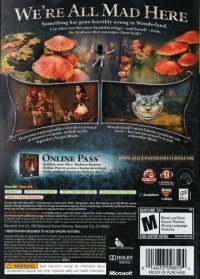 This is a list of VGCollect users who have Alice: Madness Returns in their Wish List.